Many people take up self defence for a wide variety of reasons. But there can be no doubt that some people do so because they want to feel safer when walking around. They may never intend to use their skills but just feel safer knowing they have them. Here Joanne tells why she took up karate. "I moved to London to do a postgraduate course. After living in a much smaller city for three years, I did tend to feel a little apprehensive walking around. Added to this was the fact that, although I didn't live far from where I was doing my course, no-one else lived near me so I always had to walk home alone, sometimes fairly late if we had gone for a drink or had to stay late to work on assignments. "Other than the people on my course, I didn't really know anyone in London and spent a lot of time travelling back to my university city to see my boyfriend and friends who still lived there. So I got to thinking about taking up a new activity as a way of meeting people in London. After some thought, I realised that learning some sort of self defence would give me more confidence walking around on my own. I would probably never have call to use it but at least I would know some basics if the need ever arose. "I had no idea what all of the different types of martial arts and self defence classes at my gym were but I decided to take up an actual martial art so that if I enjoyed it, I could perhaps even compete in tournaments in the future. Plus, having the gradings to aim at would keep me focused. But I was lucky in that the karate classes I chose also included some self defence work. 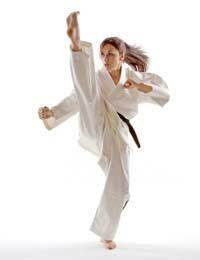 "We were taught straightaway that the philosophy behind karate meant we could not use it to be aggressive. But we were also shown non-karate moves which utilised the skills we were learning in our karate classes to fend off attackers. These did involve some crude moves but after each class I felt a little safer as I walked home. "Thankfully, I have never had to use my new found skills. But I have developed my interest in karate and have kept it up. I am now a purple belt and hope one day to gain my black belt. I love my thrice weekly classes and couldn't imagine life without them. I also now know that if I was attacked, I might not be able to fight my attacker but I would hopefully be able to do enough to shake them off and escape – karate has given me the thinking and the presence of mind, just as much as it has given me the physical skills. "And, what's more, because I have made plenty of new friends through my karate, I know more people nearby and actually very rarely walk anywhere alone anyway. I live with some of my karate friends and because we work in similar places, most days we travel home together - a safer plan all round."